Sadie Morgan is one of the founding partners of Bermondsey-based architectural practice dRMM, which is involved in a number of major regeneration projects in the capital, including at Elephant and Castle. 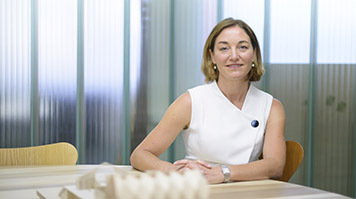 Sadie is also chair of the HS2 Design Panel and a National Infrastructure Commissioner. She recently received an Honorary Doctorate in recognition of her role in shaping our environment and promoting sustainable building practice, and for her commitment to supporting the next generation of architects. Here, Sadie explains her career progression and what inspired her to make her achievements. "The first important career lesson I learned was to value myself. For my degree show at the Royal College of Art, I created a sort of installation. One of the show’s visitors loved it, and wanted to buy it. Like an idiot I said no. But she wouldn’t give up, and I ended up designing pieces of furniture for her and eventually her whole apartment. Whenever she asked me what I was going to charge I’d get really uncomfortable. I remember her saying to me, ‘Sadie, you are a professional woman and you must learn to properly value your skills.’ That was such an important lesson to learn, and it really boosted my confidence in my own ability. When you’re doing it for yourself, and operating on a shoestring, the stakes aren’t so high. I think it makes you a bit more free and flexible in the way you approach projects. "We’ve always tried to hold on to that studio vibe. The practice has grown a lot since we started out in 1995, and the projects are much bigger now. But we’ve worked hard to retain an atmosphere where everyone, regardless of whether they’re an intern, or Part 1 or a director, gets to have their say. That culture also translates into giving people as wide a range of experience as possible. If you come to work here, you won’t get pigeonholed. There’s a huge amount of scope to try different things and see where your strengths and passions lie. And we believe in encouraging people to experiment and take risks. That’s where the best ideas come from. "There’s no such thing as a ‘dRMM’ project. Having said that, I think if you look back over our body of work you do see certain threads running through. Innovation is one of them. We were among the first practices in the UK to use cross-laminated timber, for example. It’s an incredibly flexible and versatile material, and it’s sustainable, too. And for a while one of our projects – a state school in Dulwich – had the world’s largest variable skin ETFE roof. That meant it could respond to changing environmental conditions. We’re absolutely committed to finding new solutions that are better for the environment, and that will work in the long term. I also think there’s something joyful about our buildings, and that they give something back to the community around them. Each one is made with love, and I think you can see that. "Working on the Elephant and Castle regeneration project has been a labour of love. Retaining the character of a place and preserving a sense of community are very important to dRMM. So when we got the opportunity to work on the first phase of development on the Heygate Estate, we leapt at it. The people there had put up with years of false promises. They were worried about over-development, about losing their beautiful trees, and about being overlooked. As an architect, your job is to really listen to all those concerns and take them on board. The goal is to create something new that feels like it’s been there forever. Hopefully we achieved that. "HS2 is going to be world-beating if I have anything to do with it. The role of the Design Panel is to act as a critical friend. We have to make sure that the design vision is appropriate, that it works for people in the community, respects the context, is accessible and is fit for the long term. Then we have to hold HS2 to account, and ensure that they’re delivering on that vision in every aspect from the trains themselves, to the landscaping, right down to how you buy your ticket. "It’s hugely exciting. This is the biggest infrastructure project ever. It’s something that belongs to the whole of the UK. And it’s something we should be celebrating: we have the best architects, engineers and designers in the world. My hope is that if young people can look at a project like this and think, wow, I’d like to be part of that, we’ll get a more diverse range of people applying to go to university to study these disciplines and eventually that will filter through to the professions. "I do feel a responsibility as a woman in architecture. I didn’t at the start. But as my career has progressed, increasingly people have said to me, ‘it’s important what you’re doing’. You become a role model, whether you set out to or not. I’m not a natural public speaker, but if someone asks me I will always say ‘yes’ because I think it’s important that female voices are heard. "We’re making good progress in architecture and engineering; construction still has a way to go. A huge part of that is to do with getting working conditions right for women. It’s still the case that the point at which women start to take on more senior roles is also the point where they decide to have children. We have to create a culture where women feel they can do that, then return to the workplace without in any way jeopardising their career. "My goal is to extend the conversation about the value of good design. If we can start building a consideration of design not only into projects like HS2, or the work being done by the National Infrastructure Commission, I think we’ll start to see it rising up the agenda. I think there’s still a perception of design as an ‘add on’, something that just adds cost to a project. But actually I believe that good design can save money, as well as creating an environment that is more sustainable, and better for us all to live in." dRMM’s work on Trafalgar Place at the Heygate Estate won the 2016 London RIBA award, as well as the Mayor’s Award for Planning Excellence.